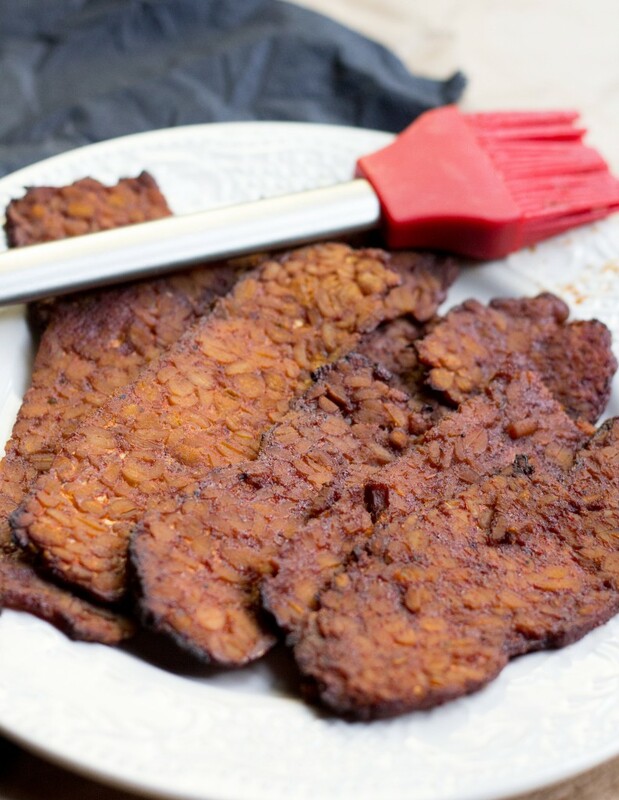 At first glance, without seeing the title of this awesome smokey Vegan Tempeh Bacon recipe, you might think – what is going on here over at Ceara’s Kitchen? Is that a plate full of meaaaat??! But I assure you friends, this Vegan Tempeh Bacon is 100% plant-based and soo dang good. No pigs were hurt in the making of this Tempeh bacon, promise! I started making this Vegan Tempeh Bacon a couple months ago to pack for J’s lunches. Guys, this Vegan Tempeh Bacon honestly makes the best BLTs. The soft bread accompanied by the crispy lettuce, juicy tomatoes, creamy mayo and salty Vegan Tempeh Bacon is seriously the best lunch ever. 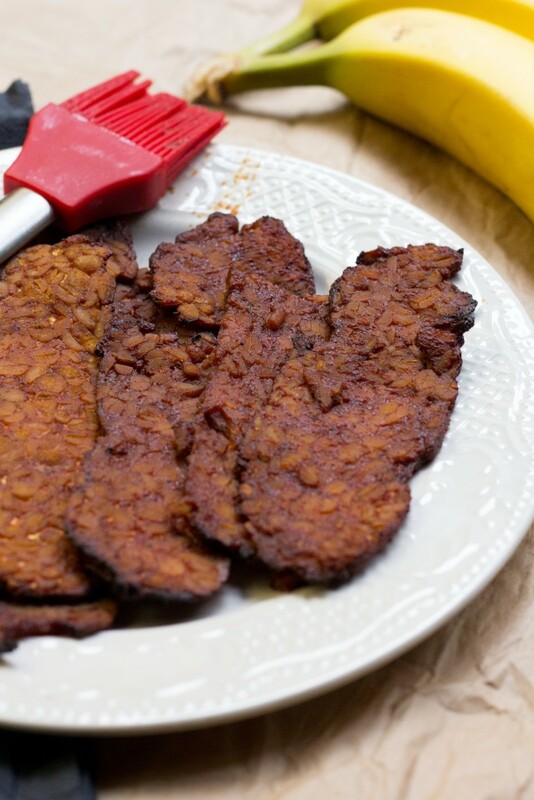 This Vegan Tempeh Bacon is made by marinating lightly sautéed tempeh in a homemade sweet and smokey BBQ sauce overnight. Marinating the tempeh overnight allows all the juices from the BBQ sauce to soak into the tempeh strips, resulting in the perfect vegan bacon – yum! The next morning, take your marinated vegan tempeh bacon out of the fridge and leave it to bake and broil in the hot oven until perfectly crispy and chewy. Serve alongside tofu scramble, monkey bread and all your favorite brunch additions for a delicious and hearty meal! 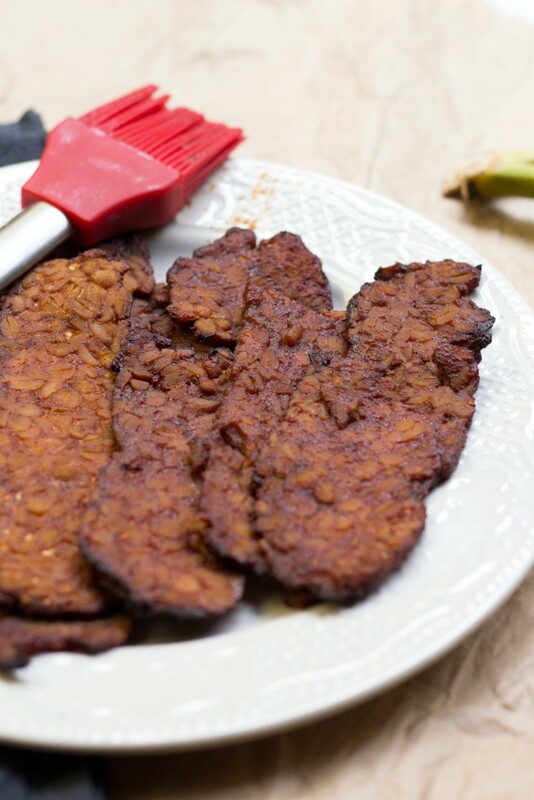 This Vegan Tempeh Bacon is crispy, salty, chewy and marinated in a homemade sweet + smokey BBQ sauce. 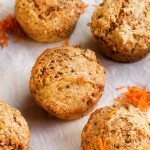 Tastes amazing on BLTs and alongside tofu scramble for the perfect brunch! Baked not fried until perfectly crispy! Cut the tempeh into thin and long strips (see photo). Make them thin enough so they are “bacon-like” but not so thin that they fall apart. Over medium-high heat, sautee the tempeh for 2 minutes on each side in the vegetable broth. This steps cuts some of the bitter flavor out of the tempeh. Prepare the BBQ sauce by throwing all the ingredients (tamari through to sea salt) into a bowl and whisking them together. Brush the BBQ sauce over the tempeh and leave it to marinate in the sauce (use all of the sauce) in a sealed container overnight. Pre-heat oven to 350F/180C. Place the tempeh bacon on parchment paper or a lightly oiled baking sheet. Bake for 7 minutes on each side (making sure not to burn the tempeh!). Broil the tempeh for an additional 2-4 minutes at the end to get the tempeh bacon nice and crispy! 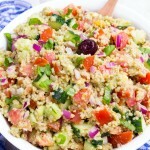 Serve the tempeh bacon with [url href=”https://www.cearaskitchen.com/easy-tofu-scramble/” target=”_blank”]tofu scramble[/url] and [url href=”https://www.cearaskitchen.com/easy-whole-wheat-artisan-bread-no-knead/” target=”_blank”]homemade bread[/url] for a real breakfast treat! 1) Make sure the tempeh and tamari sauce (or soy sauce) you use is certified gluten-free if necessary. [br]2) Keep tempeh bacon in the fridge for up to 3-4 days in a sealed container to save for lunches. Guys, I LOVE hearing your feedback and seeing your delicious #CearasKitchen creations :D. If you make this Baked Vegan Tempeh Bacon, share your photos with me on Instagram @CearasKitchen (and remember to tag #CearasKitchen so I don’t miss it!) or share it on my Ceara’s Kitchen Facebook page. Have a beautiful weekend everyone! You’ve gotsta try tempeh, Linda!!!!!! It is so much fun to cook with and has the most delicious nutty flavor! We cook with it around once a week here now 🙂 So yummy! And thank you!! In my opinion you definitely have to marinate or steam the tempeh before cooking with it to cut out the bitter taste tempeh naturally has! Sauteeing it in the veggie broth and the marinating it overnight really does the trick 🙂 Thank you, Nadia! Girl, this straight up looks like flank steak, LOL! I’ve seen this tempeh “bacon” all over the place and have been so intrigued about it. I’ve heard mixed things about the taste of tempeh, but I trust you so I imagine it is delicious. I don’t really do tofu products, but you make me want to try this! I love all the flavors you used for it! Thank you, Brandi!!! Tempeh bacon is soo yummy! It’s such a treat – my partner J love it too! It really does make the best BLTS! I have been wanting to make tempeh bacon for a while now and you have just convinced me to give it a try. It looks pretty simple. It’s so simple and yummy, Dannii! Thank you! 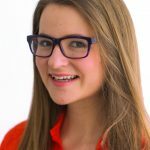 I’ve been seeing tempeh popping up all over the place, and I’m intrigued! 🙂 It’s soo totally yummy, Denise!! Thank you! Thank you, Laura!! The tempeh bacon is so yummy!!! didn’t like tempeh the 1st (and last!) time I had it… but maybe this recipe can change my opinion! love the sauce! Thank you, Manali!! Even the biggest tempeh haters would love this recipe 🙂 It’s so flavorful!